Leap Year - More Shaylauary! THANK YOU, wonderful webby was able to post Christi's video (See last entry!). Shayne is currently (finally) on a flight home. He was stranded for about 8 hours in Ft. Lauderdale today while changing planes and missing a connection due to mechanical problems. You know Shayne, he wasn't about to sit in an airport, he got a cab and went to the beach to pass the hours today! 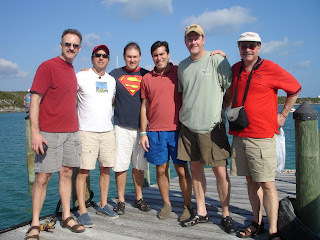 He spent the week in the Bahamas (yes, while I was shoveling the driveway - hee hee) with five other guys who have bonded over the past year. Unfortunately, all of them had children die from neuroblastoma. I was able to email with Shayne throughout the week and I understand it was incredibly emotional as they shared videos, pictures and treasured stories of these amazing kids who left us too soon! I can only hope they were in Heaven having a most glorious time fishing, sailing, eating, enjoying the beach and giving their great dads love from above. OK, so if it was the very first time, in my entire life, I ever shoveled our driveway, I think I'm doing pretty well! Smile. We really got hit with a lot of snow, but it was all ok! Regardless, we missed Shayne terribly this week; yet, I was so happy he could go and spend some very special time with some very special people. The recipe called for some interesting pizza toppings. What do you think they were? We tried out a new pizza recipe. Any one want to guess what was on that pizza? It was delicious, but it will most likely surprise you! What do you think? Just in case this video does not work, I’ll post a picture here of Shayla creating a new type of pizza and see if you can figure out what it is. It was delicious! Yesterday, with about 8 inches of snow, we had the day off. We read a chapter book, made cookies and did some other cooking. She made a snowman and put it out by the road so it’d be there for Shayne to see when he gets home. I missed my second class (first one Jan. 2005) due to weather, but with a level two snow emergency and with hazardous back roads to try to travel and significant snow accumulation, I didn’t think it was safe to even attempt it. I know that my professors in Columbus most like do not understand what I go through to get to class, so I emailed a picture of the snow and explained why I would not be trying to make the two hour drive (on dry roads). I felt very guilty and nervous about it, but then last night received an email back from my prof saying I made the right decision. Thankfully, I have some awesome friends in that class and they’re catching me up. Next week will be my last week of winter quarter! I had an idea of celebration in my head all quarter, but I think perhaps that’s changed in recent weeks. We’ll see! 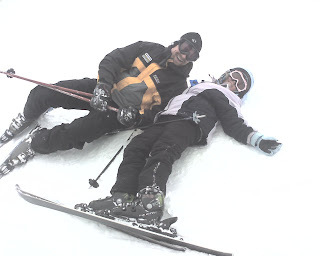 PIC: Over the weekend with Shayne, Shayla makes a snow angel as we thought of Christi. P.S. The white circles around and beside "Swifter" are just plastic "bubbles" that came with the American Girl bathtub. They really are cute, even if they confused some bloggers. Thanks! Thank you so much for giving to the "Christi Thomas Memorial Fund! "A $1,000 donation in honor of the volunteers who make the Pet’s Vet program at the Ronald McDonald House possible was awarded to the University of Penn’s Vet School on February 20th. 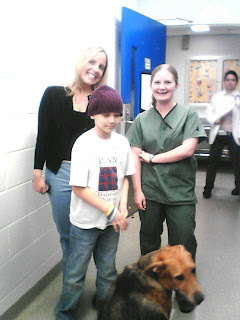 As many know, very special memories of Christi were created for us through the Vets’ Pet Program as well as at the Vet Hospital where they would allow Christi to have special tours and to “assist” with the animals’ care. It therefore has a very special place in our hearts and we are grateful they have renamed it the "Christi Thomas Vets' Pets Program!" The volunteers who bring their pets to the Philly Ronald McDonald House are remarkable. Christi (and Shayla) loved the program. It always raised their spirits to see a pet at the house. (Christi often missed her two cats while she had to be away from home). A photo memory of each visit remains a prized keepsake for our family. I was BEYOND IMPRESSED at the 4-H meeting. Shayla will be joining "The 3 R's" my best friend's group; she's an awesome advisor. Shayla loved the meeting and I loved the organization! She will be entering her bunny in the "pet rabbit" category and possibly taking a horse, we'll see. I thought you might get a kick out of her giving her bunny a bath last night. She used Christi's "American Girl bathtub" that my sister bought for Christi and that Christi really loved. I think she would have liked using it for the pet's bath too! What a hoot! As typical, "Swifter" didn't mind his bath at all. If it was “She who dies with the most books wins,” Christi won!! (Hee hee! I know Christi won and is with Jesus!) I guess clearing out and cleaning up Christi’s closet wasn’t quite enough punishment for me, so I went and cleaned out every single drawer in her dresser and every single book on her (many) bookshelves. I’ll be polite and just say the girl had literally hundreds of books. I won’t mention how they were tossed, in no order whatsoever, in many of her drawers and yet in other places they were neatly arranged in "rainbow order" on bookshelves - what a hoot! I am willing to bet she read the vast majority of them, but I did a lot of shaking my head and crying while reading many loving inscriptions of the books given to her by loving supporters, friends and family members. Shayla also reminded us that Christi would "check out" books from Shayla's room as they had their own little library system going. Shayla laughed as she told us, "I checked out books from her library too, but when I lost one she told me no more borrowing privileges." Shayne said, “Isn’t it odd at the very end, how she reverted to reading little kids books?” Of course, I remember. When she was so weak, I read them to her. She couldn’t even open her eyes sometimes, but when I stopped she’d ask for another. I also remember, before she was so ill, the countless night we’d find her in her bed reading entirely too late at night. It seemed only natural to make a donation to the Children’s Department at the Tiffin Seneca Public Library, so we did. The only thing I have left to clean up out of Christi’s room is her desk and I am no way ready to do that yet - even though Shay Shay is enjoying being blessed with all of the new books, toys, games, crafts. I admit I love finding the special little treasurers and memories; however, once her desk has been cleaned that’s all that remains untouched. I was so excited to find a little stick of Chapstick that fell off of her bedside table and down on her bookshelf underneath. I quickly put some on imagining she was giving me a little kiss since her lips last touched it. Crazy, I'm certain to those who've not lost a loved one, but oh, how I miss that funny little bookworm and would give anything to receive a real kiss from her!! Thanks to all of the people who have supported the Christi Thomas Memorial Fund! Keeping her memory alive, and helping others gives us great comfort!! and one more, but the title has escaped me! Christi was never able to read all of the books she wanted to read before her own story came to an end. Christi had a stack of books lined up, waiting to be read, when she died. With a $250.00 donation from the Christi Thomas Memorial Fund, the library purchased ten audio books Christi would have really enjoyed reading. The girls would often listen to stories as we would drive from place to place. We think this is a great tribute to a little girl who loved going to the library. 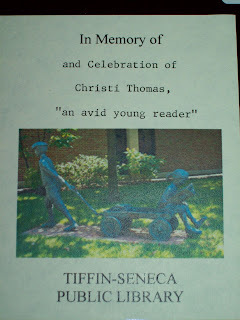 The inscription in the audio books read, “In Memory and Celebration of Christi Thomas, an avid young reader.” I hope her friends, and all of the children in the county, check these books out and enjoy them as we know Christi would have. Hopefully, many will be able to enjoy them on their iPods/MP3 players as Shayla really enjoys now. Thanks for helping her story to continue. As Shaylauary is soon coming to a close we had a huge celebration last night! We went with Jennifer (Kids Cancer Krusade) and her beautiful mother to dinner and then to see "The Lion King" in Toledo. It was amazing! Of course, when the first number started and all of the animals started parading in, tears just poured out and Shayne sweetly squeezed my hand. 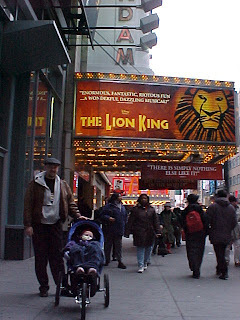 I couldn't help but think of the time in January of 2003 when we first moved to NYC and were living in the Ronald McDonald House and were kindly given front row tickets; Christi LOVED it! Weeks later, after Shayla arrived, my friend, Becky, came out and we took Shayla. Shayla says she remembered some of it, but she was only four. Last night she was on the edge of her seat. I loved watching her beautiful expressions, and catching up with our friends. Many of Christi's favorite sayings were from "The Lion King" and I think that's what made it doubly hard. "What's the motto with you?" hee hee! Christi would giggle so often by saying that, usually to her father. I'll post a couple of pics below I've never shared before. Going to a restaurant before the show. 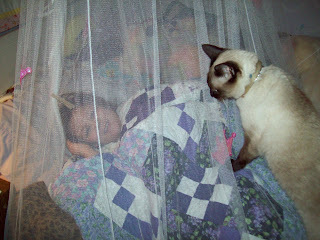 Jenn and the precious little one snuggle under Christi's prayer blanket! Isn't he gorgeous?!! Again, please accept my deepest thanks for your loving comments and suggestions regarding my stomach. I am incredibly humbled by your concern! I've been dealing with it since October and when winter quarter ends in just two weeks (Praise the Lord! I've been SWAMPED taking four classes, and teaching one, plus my real job which pays for my "hobbies".) I will go back to the doctor to inquire about the gall bladder. I "think" the Nexium is helping. I don't feel great, but I have not had any episodes, which left me in the fetal position, since I started on it. Thank you very much!! Shayla had some very exciting news this week. She learned that she IS old enough to join 4-H and to take a project to the fair. (We thought you had to be in the 4th grade, since that's when Christi took a cat project.) We'll go to a meeting on Sunday to see what it is all about. She'd like to enter her bunny and also lease a horse so she can show a horse too. (We'll see.) I understand it is a lot of work and with a horse - a lot of $$$$! I was surprised at all of the memories that came flooding back as weeks before Christi's death she was feeling pretty well and won the first place overall small animals prize with her cat project and of course Buckeye's charming appearance. 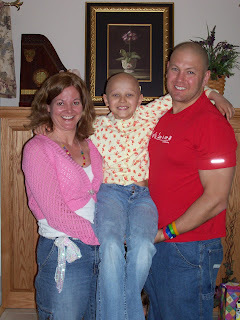 FABULOUS memories, it's just hard knowing we'll do it all again with Shayla - and never again with Christi. We're both happy to be home on a "snow day" today, despite the fact we will make this day up in the summer. We came home pretty late from musical practice last night, where Shayla never stopped smiling, so it was splendid to sleep in. Shay Shay cannot wait to get out and jump in the fluffy white stuff. I'm looking forward to great productivity with my coursework today! Tonight will be a very special evening for Shayluary! Have a wonderful day!! Oh what a beautiful morning!! Auditions were yesterday. Shayla said she enjoyed showing how she could “shrug”, “play fight”, sing a song she was taught, and hold hands and run around a circle singing with the other kids trying out. 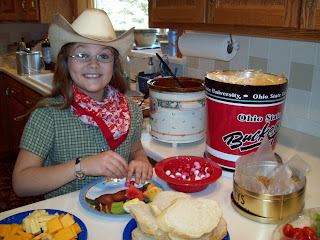 I put on a cowboy hat, got Buckeye, and went to Christi’s bedroom, where Shayla was again sleeping, to wake up Shayla in a special way this morning. In a very loud manner I started singing, “Oklahoma!” When she opened her eyes and looked at me like I was crazy I said, “Shayla!! I just got the email from your music teacher, you were one of the four girls selected to be in the high school musical!” If you can see through Christi's canopy, you will see, a very sleepy Shayla was pretty happy about that! What an amazing (and very exciting) blessing! I bought our tickets today. If anyone would like to watch the high school musical and check out our amazing brand new school, you can call the High School office for tickets ($7 adults, $5 kids). (419) 426-3312. The show dates are Friday & Saturday, March 7th and 8th at 7:00 PM and ticket sales are going quickly. 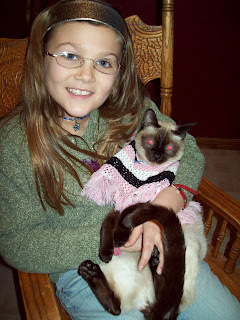 Shayla with Christi's cat, Buckeye. She dressed her in a build-a-bear outfit. 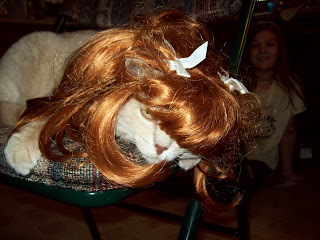 PICTURE: Shayla put Christi's build-a-bear wig on Buttercup and Buttercup could have cared less! Shayla snapped this photo. Thanks so much for your concern about my “stomach issue”. I really appreciate your thoughtful emails and postings!! I did return to my doctor and he still believes it is “gastritis” which is an irritation and thinning of my stomach lining. He said it is caused by an increase in stomach acid, produced more as we age (I am 40 now.) and while under stress. The “attacks” have occurred after eating rich, fatty foods (Chinese food, ice cream, mashed potatoes & gravy, diet Coke, brownies, and chicken nuggets). He put me in Nexium and I’m going to continue to try to avoid those foods. Even though the lady on our living room floor does not look a thing like the beautiful woman in perfect positions on my DVD, I also started doing Pilates as I know I must exercise. I hope it helps!! I really don’t like being on medication, but I do hope I feel better soon. Thanks again for your wonderful suggestions and thoughts! Although I knew one day this news would come, it is still with terrible sadness I share the news of Harrison’s death, just a couple of weeks shy of his 9th birthday. Harrison and Christi were diagnosed within months of each other and on many of the same trials together at MSKCC. He fought for an amazing 5 ¾ years – wow!! His mother and grandparents are the best! 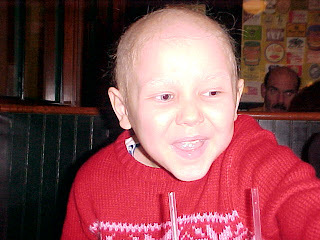 I remember one time speaking with Harrison’s grandmother and telling her how nice of her to come to the hospital with Gina and Harrison each day and she said, “How could I go off and enjoy retirement while Harrison is treating for cancer?” As I spent much of Monday crying my eyes out as I cleaned out Christi’s closet, I know none of their lives will ever be the same. Run, Harrison, run and never look back!! Shayla has really enjoyed ice skating this year. She's had about 8 lessons so far and has about four left. I wasn't feeling well enough to go ice skating for "family skate" tonight, so Shayne took the camera, told me to study and to rest my stomach, and he'd take enough pictures and video clips that I'd feel like I was there. He did! Tonight, I'll try a blogger first for me - uploading video clips. Shayne asked me today if I changed the calendar in Christi's room. I said, "No." He said, "Well it no longer is stuck on August 2006; now it's on "February"." Hmmm, imagine that! I wonder if Miss Shayulary knows that it is a 2006 calendar! Regardless, we thought it was probably best that Shayla did that. She has slept in Christi's room about three nights over the past two months. We do need to tackle her room, yet I think we're secretly wishing Shayla just takes it over as her new room to make it easier on us! Today Shayla decided that she would enter her first duathalon (run, bike, run). It's the kid part of the triathalon (swim, bike, run) that Shayne will be competiting in June. Shayla is happy to be a part of the "CHOP Team". She's been riding her bike in the living room, beside Shayne, when he does his training. There have been some little friends Christi made throughout her journey with whom we've lost contact. 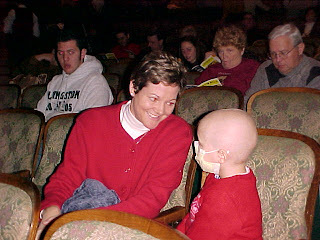 There was one very special little girl Christi loved playing with at the Ronald House in Philly on the few times we were there together in the winter of 2006. On many occasions I had wondered how the little sweetie was doing. 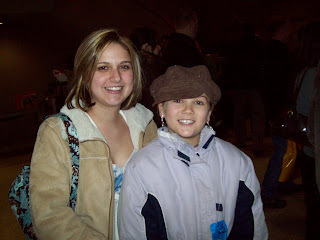 Sadly, tonight, I received an email from her beautiful mother telling me that she died a few months prior to Christi. My heart absolutely aches over this horrendous loss. May a cure be found soon! PICTURE: Christi, sitting in a little chair checking out a book, age almost three. Due to having a teachers’ meeting in Columbus Friday night, Shayla and I thrilled we were able to catch Traci (aka “Hariett”) at COSI for a bit (where Traci had a scavenger hunt waiting for Shayla to play - amazing!) and then we dropped by to see Jenn’s son. Oh, baby, he’s a sweetie! Before we headed south, I showed Shayla the prayer blanket of Christi’s I deiced to give this wonderful baby. It just seemed really appropriate as so many prayers were lifted up for him for so long. Shayla went to Christi’s bedroom and selected a little beanie baby off of Christi’s bed to give him too. We then stopped at “Baby Gap” on the way and picked up a little outfit to welcome the little joy. He is so cute and I’m thrilled we got to see him for a bit. It was so emotional for me thinking of all that had to take place to get him; we wish for him a long healthy life filled with joy and peace! Traci spoiled Shayla at “Build a Bear” and at “Claires” while I was at my meeting. Upon my return, we enjoyed a board game. Traci is the most incredible woman. I don't think she'll ever realize how much we love and adore her; she's so special to us. I’m continuing to struggle with “stomach problems”. My first “attack” was in mid-October when I thought it was food poisoning. I’ve since been to the doctor a couple of times and have some medications, even though I’m theoretically opposed to taking meds and think I should be able to control this with diet. I know my doctor told me increased age and stress are factor. Despite the fact I’m busy it is all by choice now (unlike living with cancer) and I happen to think this busy life is a picnic compared to the stress involved in years of Christi’s care. He believes it’s built up and I was under incredible stress for so long. (I no longer wake up in the middle of the night and run down to her room thinking she died without me by her side. That stress is gone! I think I am so much better, but he's probably right and the damage has been done to my stomach lining.) Since October I’ve had about one “attack” (nausea, a hard, swollen stomach and vomiting) a month; however, they’ve increased in frequency recently. I had one Wednesday night, Thursday night and Saturday afternoon. It always the same pattern, the pain in my stomach – right under my rib cage, is terrible, then the cramping and vomitting begin. I’m not exactly certain what’s up, but I don’t like this recent trend and they come on so strong and so hard, it’s scary. I cry to Shayne as I’m bent over in pain, “I just want to die,” yet I fully realize that my pain is nothing compared to my friend, Lori’s, and also to the countless days Christi didn’t feel so well, yet just wanted to play and be a little girl. I try to think of that and tell myself to just tough it out. I hope things improve. We received a phone call from Dr. Maris this morning, while we were still home due to a 2 hour ice/snow delay from school. I assumed it was about Christi’s cell line, because we know it’s been a “popular request” from researchers and I asked if I could quickly put Shayne on the other line. ow I tell myself there has been a turn of the tables and Christi, and all of the little CHOP kids, are welcoming Pat and showing her around. For some weird reason, I feel a bit of comfort knowing Pat is once again with Christi and those kids who depended on her so much. Rest in peace, dearest Pat. PICTURE: Shayla wanted to "dress up" for her birthday so she put on this dress. I put a candle in her sandwich and sang to her for which she shook her head and tried not to giggle at me. Shayla started stirring, around 5AM, as she slept restlessly beside me. 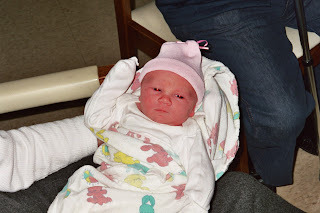 About 5:30 she asked me what time she was born. She opened a present, four books I picked out for her, this morning before Shayne left for work. We were on a two hour delay and Shayne said the weather was to worsen so we may be home all day. I figured we'd better open up those books so we would have some great entertainment if we closed today. Shortly after 8 AM she declared, "I'm nine!" We recorded her height on the wall and she's just a teeny-weenie taller than Christi was at nine, about a few inches taller than I was at nine. (She's actually the same height I was at ten.) We really appreciate our school district recognizing "Shaylauary" and giving her the day off today. She couldn't be any happier about that! 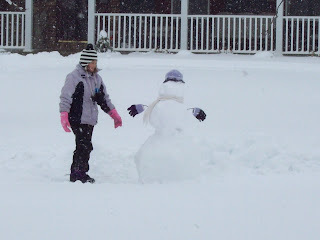 She's convinced Christi helped God create the perfect conditions to give her a great day - snow and no school! She said, "Who wants to go to school and pass out cookies for their birthday when they can have the day off? I'll pass out my cookies tomorrow and make a snowman today!" Thanks so much to the sweet blogger Erin N. We will be playing "Wacky Words" tonight when Shayne gets home tonight, yipeee!! We also think today (Shayla's birthday) is the perfect day for our dear COSI friends as they are flying back into the US with their baby!! They will be AWESOME parents!! I remember Jenn driving with Traci out to Philadelphia back in February of 2006 to help me with Christi. Jenn was reading a book about foreign adoptions. After MANY setbacks and struggles, they now have their baby and I pray for smooth travels home and a wonderful new life for them all! We hope to catch them this weekend for a bit so we can finally see this precious, loved, little one who just took its first steps. God is good! 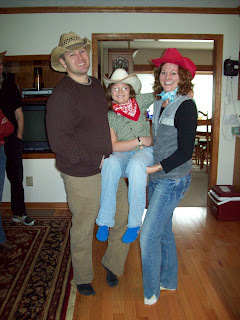 A sweet blogger, Jill, pointed out to me that Shayla's little face is poking through Christi's legs in Christi's 9th bday picture where we are holding her up. I had to laugh! I'd never noticed that and Shayla thought it was so funny too. She did not remember doing that. What a hoot! Each Year We've Taken a Bday Pic, Holding our "Baby"
Feb. 12, 1999 Baby Shayla, held by her Great Grandma Fatler on her birthday. Miss Shayla's 9th birthday party was awesome! Many thanks to everyone! It was fabulous to see her having the time of her life playing with her cousins and riding both of Aunt Marty's horses. I'll post some pictures later. I still cannot fathom she'll be "9" on Tuesday. I've been hesitant to go back and look at Christi's "9th" birthday pictures because that was such a joyous celebration and I think it'll be an emotional challenge, but on the other hand, I want to see them too. I'll try get up the courage later. Have a great day! 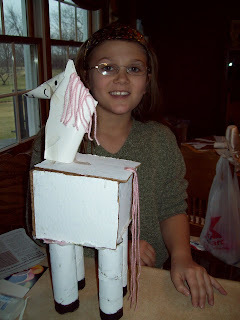 This picture shows the horse center piece Shayla made for her birthday party tomorrow. You cannot imagine how much she has reminded me of Christi lately with all of her homemade art project creations and reading, wild! Currently, she's cutting out horse tails for the "Pin the Tail on the Horse" game we'll play tomorrow at her birthday party. I’m still not ready for her to be the same age Christi was for her final year of life, but…it’s one more thing that’s not up to me. Now for that super exciting and unbelievable Shayla news! After school on Thursday Shayla bounced into my classroom and said, “I know you’re busy grading papers, but I think you’ll want to stop to read this orange paper!” I read it and tears of joy streamed down my face. I then gave her the longest hug until finally she broke away and said, “I’m really sorry about interrupting you, but I thought you’d like this news too!” I got out my cell phone so she could call and tell her daddy. that movie so much). We’ve also spoken with her about not getting a part and about not talking about this at school, or to her classmates so that no one’s feelings will be hurt. Meanwhile, it's been "career changing" (smile). She now wants to be an actress instead of an animal trainer. We still haven’t bought a birthday present for Shayla yet, but when we asked her what she wanted she said, “I don’t want anything except to get picked to be in “Oklahoma!” Auditions are next week. I think she'll be fine if she doesn't get it. She's a well-adjusted, reasonable little one. 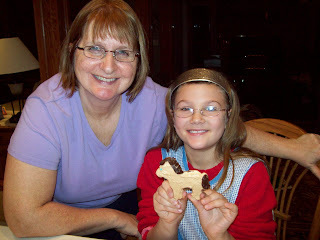 Tonight while Shayla was in her Great Aunt Marty's care, they made cookies (horses, doggies and kitties) for her weekend birthday party. Marty is the most amazing woman; we are so blessed! 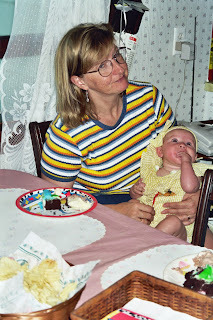 As a sweet blogger wrote me not too long ago, "Everyone should have an Aunt Marty in their life!" So true; what a grand world it would be! I have some ABSOLUTELY INCREDIBLE "SHAYLA NEWS" to share, but quite frankly I'm beyond exhaustion right now, cannot possibly type another world and must scoop Shayla up and head to bed. Be well!! The abundant blessing of having a day to stay home and study and catch up was glorious! Shayla reminded me so much of Christi on Friday. She crocheted and started an art project (making a horse by cutting up a box and painting it different colors and gluing it together, adding a yarn tail, etc.) It was really the first time I saw her act like Christi with many different projects on all going on at once. I also decided she was old enough to work on a latch hook if she was interested. I brought out the last latch hook Christi was working on - a Hello Kitty little rug, 1/4 of the way finished. 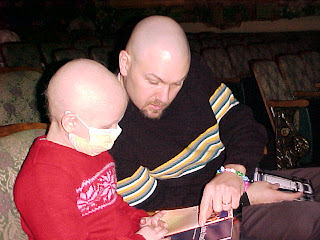 (In the bag, was a book Christi wrote in while she was in the hospital at CHOP. It always "takes me back" a couple of notches whenever I see something "new".) Regardless, Shayla was very interested in trying to learn how to latch hook and she did great. I kept imagining Christi over Shayla's shoulder saying, "Thanks for finishing that for me, Shayla!" I also started reading an incredible book to Shayla on our surprise day off Friday, "The Invention of Hugo Cabret" by Brian Selznick. (They do have a copy at the Tiffin Library!) While it's over 500 pages and looks HUGE, it's a fast read! (We finished it today.) This 2007 children's book is nothing like I've read before. There are 284 pages of original drawings so it's sort of like a picture book. It's also like a graphic novel and film. It was one of the first books I've read with Shayla that wasn't around when Christi was alive; that is something "new" for me. It seems like every book I pull out is something we shared together and it's heartbreaking to fight those memories some times. The story takes place in a museum in Paris so it reminded me of days Shayne and I spent touring many museums, including the train station turned art museum, in Paris. Friday night, we headed up to Michigan to spend the weekend with the Cooks (Christi's Webmaster and his gorgeous wife). Shayla had a wonderful time playing with their beautiful golden retrievers and playing video games with Eric. Because Alicia and Shayla both have Feb. 12th birthdays, we determined it should really be "ShaylaAliciauary"! I was THRILLED that Shayne finally broke down a bought a great bike. He has some more competitions lined up for this summer (one in Philadelphia) and the fact that his bike was over 20 years old and he bought it used so it never fit him right had been bugging me for years. He gets up three days a week at 4AM so he can be at his spin class at 5AM. I greatly admire his commitment to health and I'm happy he now has a wonderful bike to compete with! Shayla went skiing with Eric and Shayne on Saturday afternoon while Alicia and I "caught up" in the lodge. Shayla is now off of the "green" hills and on to the "blue" hills. I'm absolutely amazed at her progress. 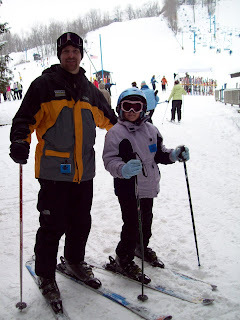 And of course I can't help but wonder if Christi would have been interested in skiing or not, seems like that little witty one is always on my mind. Thanks to Eric & Alicia for a lovely weekend, even if I wasn't much fun sitting around and reading like crazy! It's officially Shayla's birthday month (Shaylauary!) and someone could not be more excited about that! I happen to think "eight" is the perfect age, but someone thinks "nine" may even be better. When she came downstairs this morning and found my grading my OSU students' papers they turned in last night, I wished her a "Happy Shaylauary" and told her school was closed due to all of the ice out there. She cracked me up hugging me and saying, "I can't think of a better way to start off Shaylauary!" She's currently working on crocheting me a scarf (Cousin Tricia has turned her into a madwoman! Shayla has made countless "chains" and is now working on the latest step Tricia taught her), what a hoot! I'm making her pancakes with fruit for breakfast!! I'm so grateful for a day off; "The Taj" has air-conditioning (another first for me) so I have no problem making up these days in the summer! (The school is still simply amazing! For the first time in my career I have pavement to park on, not to mention INCREDIBLE technology, yipeee!) Shayne is flying home from Charleston, South Carolina today where he's been at a conference for work this week. (His new job he's been at since mid-September has been the most incredible blessing!!) Hopefully, they'll have safe travels home! Shayla has really missed her daddy, and I've missed him too!! I did not know your Christi - but, like many, my life has been changed, from what I knew about her. She touched lives - and those individuals went on to touch the lives of others. I read the stories - and I had spoken to those who knew her. On the day of the funeral I went out and bought many flowers and handed them out, so they could be laid on the ground as Christi passed, as a tribute to Tiffin's first true Princess. As I spoke to those crowding the streets, I heard the same things over and over - "I didn't know her - but I wanted to honor her" Strangers held hands and cried together in fellowship and love, for a little girl unknown to us, but yet so dear to all of our hearts. Have you ever considered writing a movie about Christi's life? The miracles she helped create - her amazing inner strengths that you have so profoundly reiterated on your pages? The world should know of her story. She changed us. She could change the world. Proceeds could always go towards Neuroblastoma research and treatment. It's a thought I've had for sometime - but, as she passed through my mind this morning - I thought it time to throw out the suggestion to those who hold Christi's dreams, and her heart.